Manfred D. Laubichler, Ph.D. is President’s Professor of Theoretical Biology and History of Biology at Arizona State University. At ASU he serves as Director of the Center for Social Dynamics and Complexity, Associate Director of the Origins Project and Director of the Evolutionary Theory Core of Complex Adaptive Systems at ASU. He is an External Professor at the Santa Fe Institute and the Konrad Lorenz Institute for Evolution and Cognition Research in Altenberg, Austria, an Adjunct Scientist at the Marine Biological Laboratory in Woods Hole and a Visiting Scholar at the Max Planck Institute for the History of Science in Berlin. His main research areas are (1) Developmental Evolution, focusing on the role of gene regulatory networks in understanding phenotypic evolution and the origin of evolutionary innovations; (2) Theoretical Biology, focusing on the conceptual structure of 21st century biology; (3) the Theory of Complex Adaptive Systems, focusing on complexity as a unifying principle in the social and life sciences, including Biomedicine; (4) Computational History of Science, applying computational methods and big data approaches to the dynamics of knowledge systems; and (5) History of 20 and 21st century Life Sciences. He is an Elected Fellow of the American Association for the Advancement of Science and has been a Fellow at the Wissenschaftskolleg zu Berlin. His undergraduate training was in zoology, philosophy and mathematics at the University of Vienna (Austria) and his graduate training was in biology at Yale and in History/History of Science at Princeton. 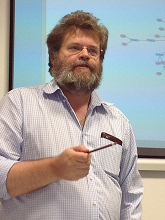 He is Associate Editor of Biological Theory and on the Editorial Board of the Journal of Experimental Zoology, Part B: Molecular and Developmental Evolution, the Archive for the History of Exact Sciences, Archimedes, and the Max Planck Research Library for the History and Development of Knowledge.